Charles was one of the best scavengers I have ever known. He took found objects and made art. In his later years he could not afford to buy art supplies and so robbed the trash cans and dumpsters of the theatrical scene shops he worked in. If he saw a piece of trash on the side of the road with an interesting shape or texture he would take it home and eventually use it in one of his assemblages. He could see art in trash. I guess his work illustrated the maxim that one man’s trash is another man’s treasure. This piece is black. I had to do an exposure like this to get a good image of it. It is in the private collection of Joan Vitale, a fellow artist. 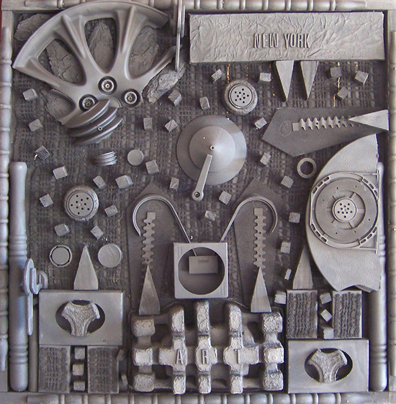 Charles, born in Brooklyn, NY and educated in New York City, was very much influenced by the art of Louise Nevelson. This is one of his finest pieces. His sense of composition was excellent and he had a way with making a play of light and shadow in his art. ~ by Sandra Lynn Gray on February 17, 2008. I am so sorry to hear of your friends death. He looked like an interesting person..what a nice smile! I like his work..it does remind one of Louise Nelson! I hope you have a piece for your collection. brilliant, I love to see art shows with things like that!